Expert: North Korea prepping EMP attack on U.S. Yes, North Korea is an EMP threat to the USA. I have warned about this for years. Now, more and coming forward about this. How prepared Canada and the USA actually are for this remains an open question, but the risk is great. An EMP attack could well be one of the ‘troubles’ that could affect the USA, Canada, and/or various others during the ‘beginning of sorrows’ that Jesus spoke of (Mark 13:8). North Korean politicians have often been playing a dangerous game with their country and their people, and hopefully they will realize that an EMP attack is not in their interests. While North Korea is not prophesied to take over the USA (Europe is per Daniel 11:39, etc. ), as I wrote in the past, it certainly is possible that it may decided to actually launch one or more missiles at the USA in the future (or take other “terroristic actions; cf. Leviticus 26:26). North Korea, sadly, is certainly capable of terrorism. It has threatened the USA and its White House in the past (see North Korea threatens the White House). If North Korea does take certain steps to sufficiently aggravate the USA into a full military conflict, it needs to realize that it likely will no longer exist as it is. At some point in time, however, I believe that both Koreas will be reunited based upon certain verses in Revelation, yet whether this will be because of a war involving the USA or something else, that is not clear. Of course, if North Korea did so, it would not do well once the USA retaliated. So, North Korea is not likely to publicly and direct nuke the USA. But with its despotic leader, almost anything is possible. And while some may find it hard to believe, North Korea is truly believed to have the ability to knock out a lot of the USA’s power supply with its electromagnetic pulse (EMP) weapon capability. EvenVoice of America (a news source operated by the US government) publicly warned about it in the past (see VOA: ‘US Defenseless Against North Korean EMP Threat’). 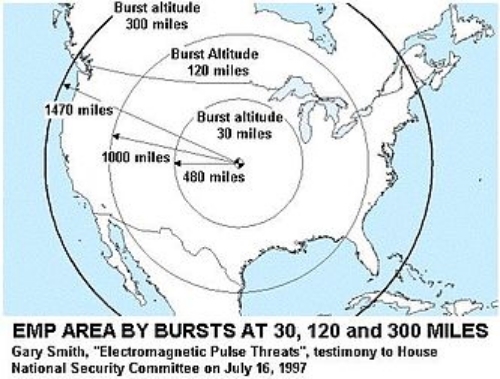 Disasters, especially if there is an ElectroMagnetic Pulse (EMP) attack or a severe solar flare storm, could be part of a so-called “perfect storm” of events that could set the USA for destruction. The USA, despite its military strength, is vulnerable to being hurt by EMP weapons as well as nuclear weapons, chemical weapons, dirty bombs, terrorism, and biological weapons. Everyone knows that EMPs can basically work as advertised, this may give the North Koreans more reason to look further into using them if they feel pressed. This may not bode well for the USA or Canada. Perhaps I should add that Iran and the Europeans also have this capacity. The USA and Canada may well be hit by EMP weaponry, and there are many places that have the potential to hit them that way. Older PostScores killed in Damascus! A prelude to Isaiah 17:1?